A beautiful collection of 130 modern Edmonds baking recipes – with every recipe photographed. The book is divided into four sections: Biscuits & Slices, Cakes, Pies, Pizzas, Breads & Buns and Christmas Treats. The old Edmonds favourites such as Anzac Biscuits, Coffee Cake and Pavlova are included as well as delicious new recipes such as Macadamia Nut and White Chocolate Biscuits, Panforte and Feta, Olive and Sundried Tomato Calzone. 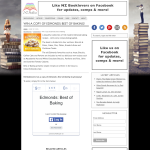 Best of Baking presents simple recipes all written in the easy-to-follow Edmonds style.